"Domestic pressure rather than events in Asia governed the USA's intervention in, and conduct of, the conflict in Korea." How far do you agree with this view? On the 25th of June 1950, the communist North Korea (Democratic Peoples Republic of Korea) invaded the capitalist South Korea (Republic of Korea). Within two days, USA, the world's most powerful country, became involved in a civil war of a small Asiatic country. One of the main reasons USA became involved in the war were the domestic pressures Truman administration was under. However, other factors, such as events in Asia, international pressure and the concept of the Cold war context governed USA's involvement and conduct of the war. After the World War Two, America found itself in ideological and economic conflict with its one time ally, Russia. Nazism was replaced with Communism, and Stalin replaced Hitler. American propaganda vilified communism to the maximum, and the Truman administration was under pressure not to appear "soft on communism". This was especially true due to the repeated attacks by the Republicans on Truman. Spy scandals such as Algar Hiss case and the Rosenberger's added to general paranoia created by Senator McCarthy, a Republican. Truman was determined not become a victim of McCarthyism and to appear decisive in the war against communism. ...read more. He also learned that appeasing aggressors never worked, and in his eyes Kim Il Sung was nothing more than Stalin's puppet. And that, arguably, is the most important reason why USA became involved. Americans saw Korean War in the Cold war context. To them everything that happened in the world was the result of the conflict between capitalist and communist. Due to their monolithic view of Communism, they were convinced that Kim was fighting on the orders of Stalin. Because of this they could not afford to lose anything - cold war was zero-sum game. Losing Korea would be unacceptable if they wanted to win the Cold war. Domestic pressures and events in Asia, as well influencing USA's decision to become involved in the war, had a tremendous impact on the conduct of the war. Although the expedition to Korea was nominally UN venture, the armed forces were dominantly American under the command of General MacArthur. As such, majority of the decisions were American. Previous events in Asia affected the opening stages of the war. Truman distrusted Sigmund Rhee, president of the Republic of Korea, and as such refused to give military weapons and support to Korea. USSR reinforced DPRK army had no problem in driving poorly armed ROK back into the Posen pocket. ...read more. However, in addition to these arguments, there is strong indication that the Cold War context played a significant role in the conduct of the war. This is demonstrated by the continuing argument between the USA and Chinese forces over the treatment of Prisoners of War. Under Geneva convection, after cease of hostilities, all PoWs were to be returned to their forces. USA however, found that many Chinese and North Korean soldiers did not wish to return. They considered this a major propaganda victory if it can be used. As such, they refused to surrender all the PoWs, resulting in continuing of hostilities long after it was necessary. This event indicates that American's considered Korea just a steppingstone in the Cold war. To them, the propaganda victory was more important than ending the war. They wanted to win the Cold War, not so much the Korean War. From all the different factors, it can be determined that although domestic pressure had a great deal of influence over America's involvement and conduct of Korean War, it was not a prevailing factor. And, in spite of their importance, were the events in Asia. 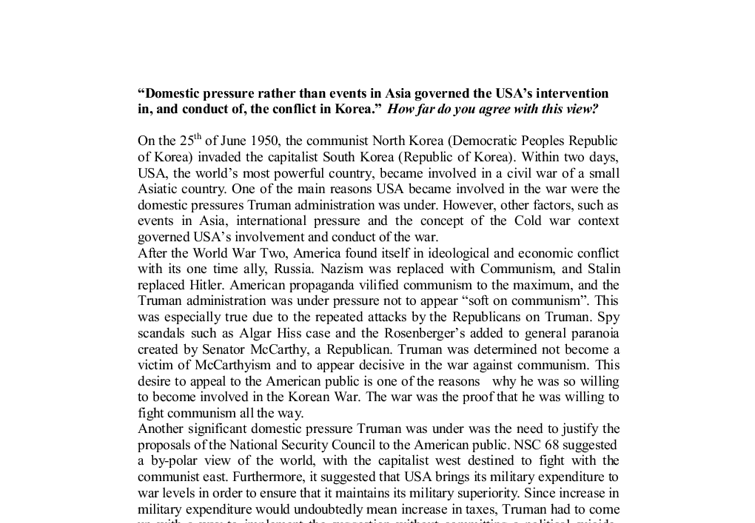 It was the Cold War context under which USA regarded the Korean War that was the primary influence on the USA behaviour. USA was aiming to win the cold war, and behaved with that aim in mind. ?? ?? ?? ?? Maja Jovanovski 07/05/2007 ...read more. USSR and China became closer following the end of the Chinese Civil War because in early 1949, Mao outlined future PRC foreign policy. It was based on the principles of making a new start, consolidating the Chinese Communist Party's (CCP) domestic position, fostering economic growth and 'leaning to one side'. On the other hand, the middle class and peasants were treated with no respect, and they were to give into the Japanese government without anything in return. There was indubitably a bias in opinion and ideology on the war in the higher class, who were benefiting from the war, and being for it. Pilots were instructed to head for that island if they got into trouble. The SA-16 amphibious rescue plane, which enjoyed speed and range over the helicopters, accounted for many of the water pick-ups in that region. In all, FEAF's Air Rescue Service recovered 996 United Nation troops from behind enemy lines, of which 170 were United States Air Force airmen. North Korea and South Korea after the Korean war. have nothing to do with reuniting the two states into one nation, but it is symbolic and shows cooperation from both sides of the DMZ. After successfully reuniting families, on July 4th 1972 officials from the ROC and DPRK exchanged visits and agreed to work towards a peaceful reunification. 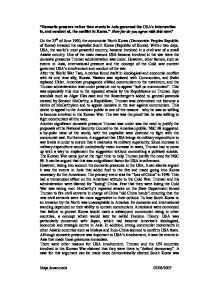 Red Scare and USA domestic policy in the 50&amp;amp;acute;s.
Furthermore, American spies reported to President Truman that Stalin was using the Cominform to help communists gain power in Malaya, Indonesia, Burma, the Philippines and Korea. Truman and the Americans watched this with increasing anxiety. They thought that communist countries were acting together to spread communism.